If you’re curious about the current NFL standings, how the Golden State Warriors are doing in their undefeated start to the NBA season, or perhaps what’s happening in the English Premier League, look no further because this article is not what you need. Not one of the aforementioned topics will be discussed, as you will have no trouble hearing about them from any major news network. Instead, we will be exploring the unique and exciting world of wacky sports that are sure to leave you scratching your head if nothing else. With that, the Sports You Didn’t Know Existed saga continues. Born in England, this sport utilizes Brompton Bicycles which are small, foldable versions of the two-wheel bicycle. 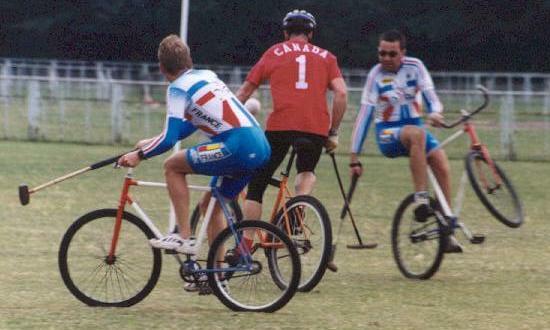 Players then play a normal game of polo, but on the rather cute Brompton bike instead of a horse. The grace of playing polo on horseback is certainly lost in the Brompton bike version, but the new addition to the sport is unique if nothing else. 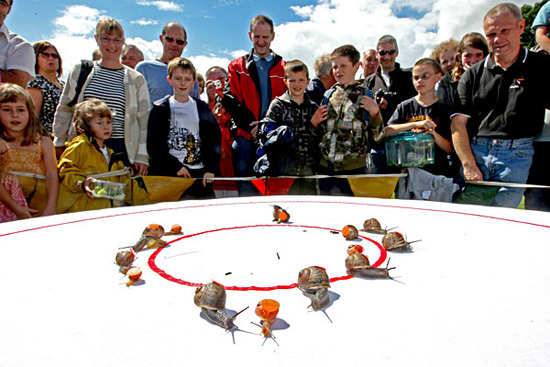 Yet another bizarre sporting event from England, the World Snail Racing Championship consists of, you guessed it, people racing the snail, a terrestrial mollusk known for its intense speed. The snails are placed in the center of a large circle and race outward towards a finish line that circles thirteen inches away from the start. Though this competition is usually an event saved for children, this year’s winner is Dale Thorne, a 31 year-old man, who appears to have a true passion for the sport. Picture your typical game of volleyball, players lined up on both sides of a net, trying to hit the ball over to the other team’s side. Now imagine that the players can only use their feet, knees, and chin. That is the basis of Sepak Takraw, which was first played in Southeast Asia in the 1400’s. The game is gaining popularity throughout the world with matches being held in Canada, the United States, and Japan along with many countries in Southeast Asia, such as Malaysia and Thailand. Created in the 17th century by Swiss farmers, Hornussen is a sport that resembles both golf and baseball. Play is initiated when the batsmen strikes the puck toward players waiting in a distant field where they will try to stop it in flight using a board-like apparatus called a Schindel. Perhaps the most interesting aspect of watching Hornussen is seeing the batsmen use the standard long, elastic club to propel the puck a great distance. This Japanese sport plays on humanity’s innermost desire to chuck snowballs come the winter snow. The competition is similar to capture the flag, but with the incredible fun of a good old-fashioned snowball fight. Teams of seven are allowed to pre make up to 90 snowballs. For protection, players wear special helmets with face shields. Yukigassen translates to snow battle, and with how entertaining it seems, the concept is sure to spread like wildfire.